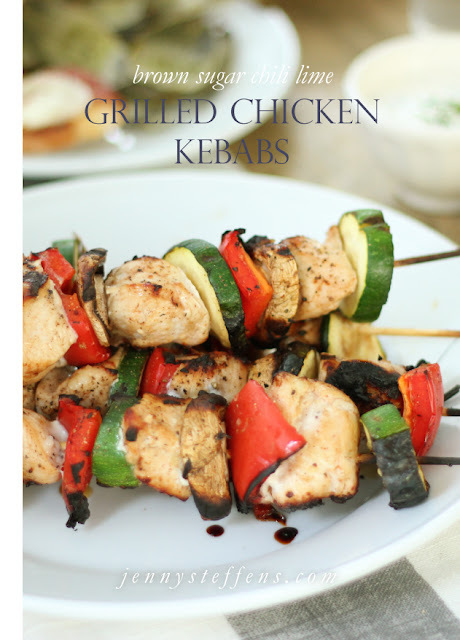 I think kebabs might be the single best Summer Entertaining recipe. They are the perfect thing to serve at a every type of party. Dinner party? Make them big. Cocktail party? Make them small. Vegetarian guest? Leave off the meat. They are made completely in advance, they are a full meal in one efficient package, and you can make them in endless varieties. Need one more reason? Budget friendly. A pound of steak, chicken or shrimp can be stretched to serve 3-4 people by adding colorful (and inexpensive) summer produce like squash and peppers. Oh, and they are healthy! Here is one of our favorite versions... what's yours? In a large bowl, combine all of the marinate ingredients. Separate the marinade into two separate bowls. Slice vegetables then place them in one of the bowls of marinade. Cut the chicken into large cubes, then put them in the other bowl of marinade. Let the vegetables and chicken marinate for 1 hour (or more, up to overnight) in the refrigerator. Skewer the chicken and vegetables on wooden or metal skewers. Grill for 3-5 minutes, on each side until the chicken has cooked all the way through. For a complete grilling party menu, serve the kebabs with Grilled Artichokes with Lemon Caper Aioli and Grilled Prosciutto & Fresh Mozzarella Toasts. Marinade sounds delicious. I am going to try this weekend! This looks so good! Love that it has zucchini, yum! Made these last night & everyone loved them. So easy to make & so yummy!